Franz Koenigs, Haarlem, by whom bought from the above on 26 July 1937, and thence by descent to the present owners. L. Venturi, Cézanne. Son art, son oeuvre, Paris, vol. I, 1936, no. 1057, p. 271 (with incorrect measurements, dated 1890-1900; illustrated vol. II, pl. 309). L. Venturi, Paul Cézanne - Watercolours, London, 1943, pp. 12 and 15 (illustrated pl. 7). L. Zahn, Paul Cézanne - Aquarelles de Paysages, Baden-Baden, 1957 and Paris, 1958 (illustrated pl. 8). W.V. Andersen, 'Watercolor in Cézanne's Artistic Process', in Art International, 25 May 1963, (illustrated); titled 'Le parc du Château Noir'). A. Chappuis, The Drawings of Paul Cézanne, A Catalogue Raisonné, vol. I, London, 1973, no. 1091, pp. 249-250 (verso, with incorrect measurements; illustrated vol. II). L. Venturi, Cézanne, London, 1978 (the verso illustrated p. 119). J. Rewald, Paul Cézanne, The Watercolours, A Catalogue Raisonné, London, 1983, no. 534, (illustrated p. 218, with incorrect measurements). Paris, Galerie Renou & Colle, Aquarelles et Baignades de Cézanne, June 1935. Basel, Kunsthalle, Paul Cézanne, August - October 1936, no. 86. Amsterdam, Paul Cassirer, Fransche Meesters uit de XIX Eeuw, July - August 1938, no. 11 (illustrated). Centenaire du Peintre Indépendant Paul Cézanne, March - April 1939, no. 50. London, Paul Cassirer, Paul Cézanne - Watercolors, July 1939, no. 26. The Hague, Gemeentemuseum, Paul Cézanne, June - July 1956, no. 73 (illustrated). Zurich, Kunsthaus, Paul Cézanne, August - October 1956, no. 120 (illustated pl. 54). Munich, Haus der Kunst, Paul Cézanne, October - November 1956, no. 90 (illustrated). Cologne, Kunsthaus Lempertz, Wallraff-Richartz Museum, Cézanne, Ausstellung zum Gedenken an sein 50. Todesjahr, December 1956- January 1957, no. 48, p. 74 (illustrated; titled 'Im Park von Chateau Noir' ). The Hague, Gemeentemuseum den Haag, Paul Cézanne 1839-1906, no. 73 (illustrated; titled 'In het bos' and dated '1890/1900'). Paris, Institut Néerlandais, Le dessin français de Claude à Cézanne dans les collections hollandaises, May - June 1964, no. 206 (illustrated pl. 163; p. 172); this exhibition later travelled to Amsterdam, Rijksmuseum, June - August 1964. The tall, narrow trunks of Aleppo pines frame this composition on either side, forming a portal that invites the viewer's gaze toward the undulating folds of a hillside landscape in the near distance. A row of trees marks the middle ground, and an opening among them directs the eye upward to floating veils of foliage. In his entry for this superb watercolor, John Rewald cites Lionello Venturi's description of a somewhat earlier work with a similar vertical emphasis (Rewald Watercolors, no. 322; circa 1890), in which the lines 'not only outline the trees or encompass the structure of the composition, they are poetic expression. They spring upward and, vanishing toward the upper edge of the picture, are cut short by it, suggesting infinite ascension. Furthermore, these lines vary in thickness and are interrupted here and there by reflections of light-- that is, they lose their identity as lines in order to become thoroughly incorporated in the pictorial effect. Unity of the effect is thus accomplished and the work of art is fully realized' (op. cit., p. 164). This scene is hardly picturesque-- neither Monet, Renoir nor Sisley would likely have paused here to paint. The locale is probably the rocky incline, rutted with ancient crevices and caves, yielding here and there to the roots of hardy pine trees, north of the road that leads from Aix toward the hamlet of Le Tholonet, a short distance above a better-known site in Cézanne's pictures, the Château Noir. Joseph Rishel has noted that this 'was one of Cézanne's favorite haunts, offering the seclusion he deemed necessary for his work, particularly at this stage of his career. It must have been an agreeably cool and protected place, sheltered from the intense Provençal sun. Cézanne did some of his most meditative and serene landscapes at this site...' (in Cézanne, exh. cat., The Philadelphia Museum of Art, 1996, p. 454). Cézanne had known these special haunts around Aix from childhood. As a younger man he had avidly hiked to his 'motifs,' but now in his sixties and suffering from diabetes, he normally journeyed by carriage along the route du Tholonet, waiting until after four in the afternoon, when the heat of day had subsided. J.P Rivière and J. F. Schnerb, artists who visited Cézanne in January 1905, wrote that 'Cézanne preferred to work during the hours when the low sun cast an especially warm light on objects... 'Day is on the wane,' he would say. You see, he was less interested in painting the violent contrasts that the untamed sun imposes than the delicate transitions which model objects by almost imperceptible degrees. He painted modulated light rather than full sunlight' (in 'The Studio of Cezanne,' M. Doran (ed. ), Conversations with Cézanne, Berkeley, 2001, p. 88). Emile Bernard recalled one such outing during a visit to the artist in 1904. 'We set out joyously, following a route that became more and more impressive. Pine forests appeared at last, and he made me get out so I could have a better look at the views with him. We explored the area together. In spite of his age, he was very nimble walking among the rocks... When he was in a difficult spot, he got down on all fours and crawled while chatting' (in "Memories of Paul Cézanne," M. Doran, ed., ibid., p. 71). Most of all, it was the enveloping physicality, the experience of being enclosed within nature, that attracted Cézanne to this woodland interior. He could look around, and shielded by the umbrella-like tops of the pines above him, not even notice the sky. There was no distracting play of light on the forms that lay before him. Sir Lawrence Gowing has pointed out that 'While his contemporaries painted effects, Cézanne painted things' (in 'Cézanne: The Logic of Organized Sensations,' Cezanne: The Late Work, exh. cat. The Museum of Modern Art, 1977, p. 55). Theodore Reff has drawn attention to the psychological motivation for these preferred sites. 'This taste for remote, inhospitable corners of nature, in which his deepest, most troubling feelings could be projected, is as typical of Cézanne's last years as the taste for open and attractive ones is earlier... The appeal of such a motif was more than purely pictorial: in the shadowy forest interior Cézanne found an intimate, solitary world for meditation [fig. 1], and in the almost chaotic profusion of forms, from which an order half natural and half human gradually emerges, a metaphor for his own mental process' (in 'Painting and Theory in the Final Decade,' exh. cat., ibid., pp. 23 and 26). The forest interior was perhaps in Cézanne's mind a natural metaphor for the sacred space of a cathedral, in the Gothic style that he so admired. The trees in their soaring verticality arch overhead, and the diagonal branches extend sideways like flying buttresses. Cézanne, who re-avowed his Catholic faith during these later years, was surely seeking a place in which he could experience most intensely a mystical, divine presence, the being whom he called, in a letter to Bernard, the Pater Omnipotens Aeterne Deus, whose 'show... spreads out before our eyes' (J. Rewald, ed., Letters, 15 April 1904, p. 301). He had come to think of the landscape in terms of a vast architectural space. In the same letter to Bernard, in which he famously advised the younger painter to 'treat nature by means of the cylinder, the sphere, the cone,' he went on to point out that 'Lines parallel to the horizon give breadth... Lines perpendicular to the horizon give depth... Nature is for us men more depth than surface.' His meditations on nature were analytical and perceptive, but at the same time deeply felt. 'I paint as I see, as I feel-- and I have very strong sensations,' he declared to Bernard (quoted in J. Rewald, History of Impressionism, New York, 1961, p. 246). There is even the suggestion of sensual longing. Reff has noted how Cézanne might discover in the landscape, as one might detect in the ample protuberances, recumbent recesses and cleft forms in Sous-bois, 'the semblance of a human form, a female body half-hidden in shadow, yet emerging into light in voluptuously rounded shapes' (in op. cit., p. 26). Cézanne normally chose to paint the Château Noir and the quarries at Bibémus in oil, a medium of inherently material substance, but the more mysterious and hermetic woodland scenes lent themselves to watercolor, which the artist applied in gossamer, patch-like washes. Reff has written that 'the transparent, liquid color allows him to explore the immaterial and evanescent in nature, the stirring of branches in a breeze... qualities that he rarely tries to capture in the more robust medium [of oil paint] and that we do not normally associate with his art' (ibid., p. 29). Through his use of watercolor Cézanne discovered how to place colors side by side in order to modulate forms and suggest the shifting structure of planar elements in both landscape and still-life, thus heralding his late style of oil painting. His reliance on these reduced means, and his mastery at utilizing the simple juxtaposition of classical and baroque contrasts-- his use of strictly vertical lines to set off more involuted forms-- are plainly in evidence here, and bear witness to these signal developments, which took place within the artist's final decade, from about 1895 to his death in 1906. While clearly a late work, the actual dating of Sous-bois, and the drawings on the verso as well, are actually somewhat flexible within these overall parameters. Venturi initially ascribed the watercolor to 1890-1900, and in his later notes for revision, placed it with in the narrower frame of 1895-1900. Rewald settled on 1900-1904, and acknowledged that it might have been painted somewhat earlier. Cézanne apparently first used the sheet for the sketches on the present verso in 1892-1896, according to Adrien Chappuis (op. cit. ), who related the hat to those seen in the famous Les joueurs de cartes, 1890-1892 (Rewald Paintings, no. 706; The Metropolitan Museum of Art, New York). This soft, malleable workman's hat is very likely Cézanne's own, such as that he wore in his self-portrait, Cézanne coiffé d'un chapeau mou, 1894 (Rewald Paintings, no. 774; fig. 2). It is certainly plausible that Cézanne returned to the partially covered sheet, which was laying about in his studio, at some point five to even ten years later, in order to re-use it for a fully rendered watercolor, just as he had the habit of going back among older drawings in his sketchbooks and filling in the blank leaves, or even over-drawing existing sketches, as he saw fit. The Rewald dating of 1900-1904 would definitely place the site of Sous-bois along the route de Tholonet outside Aix. 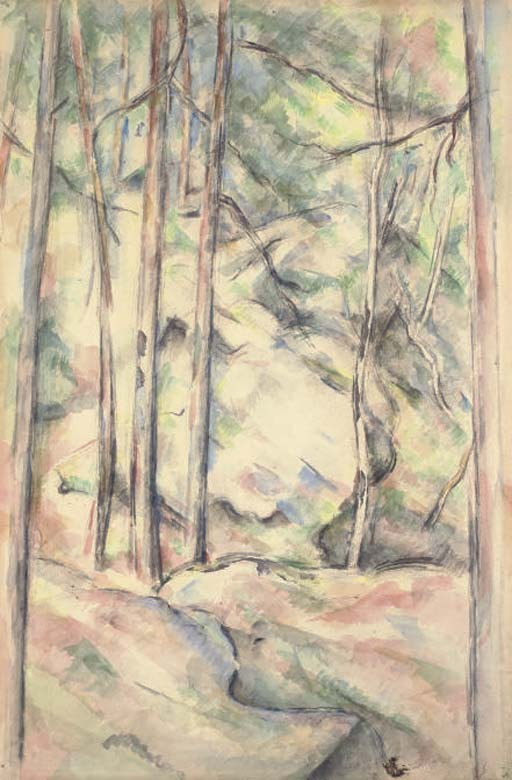 A slightly earlier dating opens the possibility that the watercolor may have been done in the forest of Fontainebleau, were Cézanne painted during the summers of 1898 and 1899. He returned there a final time in 1905 (as seen in fig. 1). Rewald noted that the oil painting Intérieur de fôret, 1898-1899 (Rewald Paintings, no. 905; Fine Arts Museums of San Francisco), which shows a similar motif seen perhaps from a different vantage point, may have been done in either Fontainebleau or near the Château Noir. Compare, however, Sous-bois devant les grottes au-dessus du Château Noir, also ascribed to 1900-1904 (Rewald Paintings, no. 880; fig. 3). This painting incorporates the sentinel-like trees at right and left sides. It moreover expresses a sense of beckoning mystery, and invites the viewer, by offering up the simple beauties of the natural world, to an inward journey of thought and feeling, a calling to which we similarly respond in the serene and meditative forms of Sous-bois.